Ghasts may be the least of players' worries when Minecraft gets its Halloween update. Last week, Minecraft developer Notch revealed the game's deadly ghasts; flying, flame-breathing jellyfish that will be added in the upcoming Halloween update. An new in-depth preview of the update's features now brings information of another scary creature: the zombie pig. Zombie pigs don't initially appear to be as nasty as the ghasts, but they do oink and make creepy "zombie gurglings" according to PC Gamer. The pigs reportedly aren't hostile, until you attack them. If you do, you'll evidently get killed very quickly as the zombie pig feasts on your corpse. However, if you manage to kill one, it'll drop a pork chop. Sounds worth the risk to me. 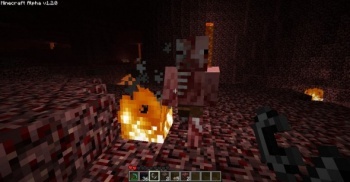 Like the ghasts, zombie pigs are only found in the new zone that was once called Hell, is now called the Slip, and could have its name changed again in the future. The Slip is known to be entered through a portal made of 14 obsidian cubes, and allows for faster travel than in the above world, but think twice about using it because I think I already told you about those zombie pigs. Another new reveal from the Slip is a type of block that slows you down when walked across, like a "sticky mud." The new biomes feature was also detailed, which makes Minecraft's environments more varied and exciting to explore. Biomes change Minecraft's climate gently between different areas, such as grass, desert, and snow, with Notch also adding specific terrain features like special kinds of vegetation and creature spawns. Biomes are great and all, but zombie pigs? Minecraft deserves to sell more than 500,000 copies just because of those.